The summer of 1796 saw the two French armies of Jourdan and Jean Victor Marie Moreau advance into southern Germany. They were opposed by Archduke Charles, who supervised two weaker Austrian armies commanded by Wilhelm von Wartensleben and Maximilian Anton Karl, Count Baillet de Latour. At the Battle of Amberg on 24 August, Charles managed to concentrate superior numbers against Jourdan, forcing him to withdraw. 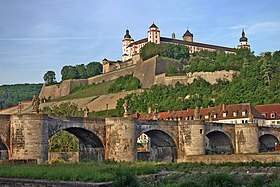 At Würzburg, Jourdan attempted a counterattack in a bid to halt his retreat. After his defeat, Charles forced Jourdan's army back to the Rhine. With his colleague in retreat, Moreau was isolated and compelled to abandon southern Germany. Jourdan's imagined superiority diminished even more when the division of General-Major Anton von Elsnitz to the north kept the much larger force under General of Division François Joseph Lefebvre out of the battle. Meanwhile, Austrian engineers were laying pontoon bridges over the Main in order to let the remainder of the Austrian army cross the river. The French attacked the Austrian position without success until the Austrian divisions of Feldmarschall-Leutnant Paul Kray and Feldzeugmeister Wilhelm von Wartensleben arrived and drove the French off the field. Smith, Digby; Kudrna, Leopold. "Biographical Dictionary of all Austrian Generals during the French Revolutionary and Napoleonic Wars, 1792–1815". napoleon-series.org. Retrieved 30 December 2014. Nafziger, George. "Austrian Army at Wurzbourg, 3 September 1796" (PDF). United States Army Combined Arms Center. Retrieved 30 December 2014. This page was last edited on 22 July 2018, at 19:01 (UTC).